Though it uses Olly I am following with IDA. 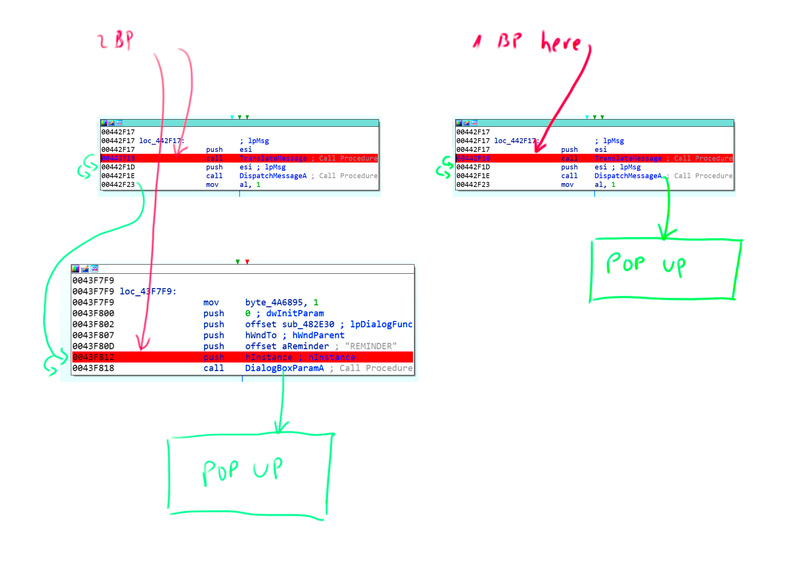 Basically i am tying to catch where a popup decision is taking place in the program. I though i placed a BP on the right spot. What I don't understand is this: When I placed only one BP on this location: and I run the debugger, it stops on this BP. I press F8 and it continues to "push esi", F8 and I get the pop up message I was looking for. However, when I place another BP on this location - this one was deducted from the tutorial which uses Olly. And i follow the same debugging procedure; I press F8 and it continues to "push esi", F8 and It stoops on the new BP @0043F812 and only after pressing F8 again i get the popup after it calls "DialogBoxParamA". So my question is why do I not get to DialogBoxParamA @43F818 when i obly place 1 BP? How can i jump from "DispatchMessageA" which is an external all to @43F818 ? Should not I be able to follow the same trace regardless on the number of BPs? TranslateMessage & DispatchgMessage are the standard windows functions when you are dealing with WinAPI and messages loops. When a DispatchMessage is called, the message stored in esi is processed by Windows and then the message handler in the application is called and this is where you see your DialogBoxParamA. The windows handler is registered in one of the fields of the WNDCLASS structure, namely lpfnWndProc. When reversing WinAPI application the most obvious place to look for interesting code is to locate the message handler code. So in summary, when you have your 2nd breakpoint in the windows handler code, when this messages is processed you end before DialogBoxParamA. If you don';t have it there , messages is processed, Popup displayed, and you continue where you were before. Not the answer you're looking for? Browse other questions tagged ida debugging debuggers patch-reversing or ask your own question. What is array of applicable components? Can I get different thread registers with PyDBG?